Hi there folks! 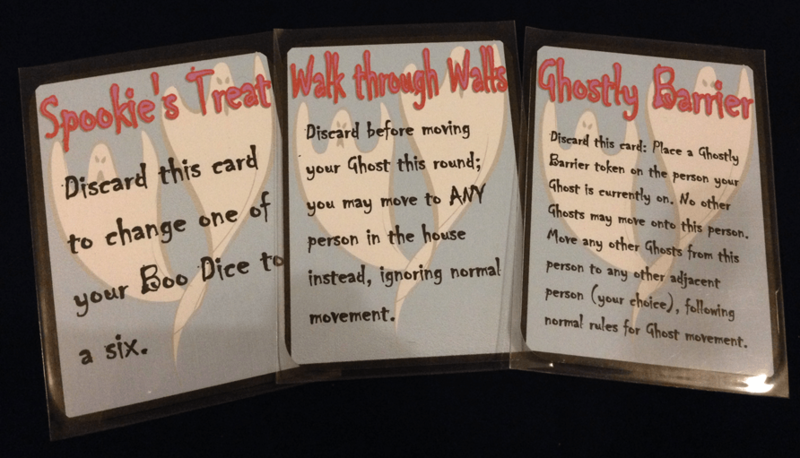 For what is probably my last design blog piece for Ghostel, I wanted to look at the part of the game which gives the most variety to game play, the Spookie Favours. These are cards bought from The Ghost in the Attic during the Day Phase. Each one allows you to bend or break the rules of the game to your advantage or your opponents’ disadvantage. Some will let you reroll dice, others will allow you to move to anywhere in the house no matter which room you’re in, whilst others will let you set up barriers that prevent other players interfering with your scores. Now the reason these got included in the game was two-fold. Firstly, without them Ghostel becomes a very mathematical affair, both dry and one dimensional with little ‘secret strategies’ possible. In all the playtests without them, I had to watch my players yawn and make surreptitious glances at their watches, or sometimes less subtle exclamations of displeasure! Introducing the Favours gave the players some secret tech to deepen their strategy, to give them one over on everyone else at the table. This intrigue suddenly transformed Ghostel into a different affair, without removing the strategic side to the game. Players now didn’t have all the information, which created an undercurrent of tension that led to those wonderful moments of smack talk amongst the players as a three pip die suddenly becomes a six, or someone suddenly hops to a room the others weren’t expecting. Can’t get to that room in the corner? With Walk Through Walls, now you can! The second fold of this mechanical origami metaphor was the inspiration for the Spookie Favour’s design. At the time I first conceived of Ghostel, I was super into the World of Warcraft TCG. Now in most collectable card games the cards themselves create the strategy by contradicting the rules of the game, allowing players to perform actions they shouldn’t be able to do like draw extra cards or cause damage directly to opposing enemies. I rapidly fell out of love with the TCG model (I also turned a little green when I toted how much I was spending in a month on this cardboard addiction, but I digress) however I took the lessons in game design it presented. All in all, the Spookie Favours add a strong thematic flavour to Ghostel whilst providing the mechanical equivalent of costumes at Mardi Gras; it works, but without the flair and fun factor. Without them Ghostel is more like homework than a game; with them the speculation amongst the players makes for the friction needed to keep the players at the table. Do you know of any games where a single mechanic made the difference? Do you prefer your games with all the information visible or with some elements unknown? Do Spookie Favours make sense thematically? As always, we’d love to hear from you! 2 Responses to "Ghostel Design Blog #6 – Breaking the rules with Spookie Favours"
I definitely enjoy a bit of hidden information in a game – it helps prevent ‘analysis paralysis’. Furthermore, it usually allows the losing player to blame their loss on luck, since for there to be asymmetric information I think there needs to be some randomness by definition. Even if the information was a choice or selection made by one player, this can feel like luck (and in some games, if you play optimally, it is indistinguishable). Hidden info, when known to one player, also allows for mindgames and other forms of interaction. I wonder if – as a rule – the higher the % of hidden info, the lighter the game? I think you could be on to something there Bez. Hidden information can make a game feel random, and the more information that goes unseen the less control players can feel. Games like One Night Ultimate Werewolf remind me of this. Sure you have some social cues you can look for, but often it comes down to a guess. It works though as it’s very light.